Here, we have summarized the most frequently asked questions. Microbeads are tiny plastic particles that are added to personal care products. They are commonly used to scrub the skin or clean your teeth. Microbeads is a marketing term introduced by the cosmetic industry. The microbeads industry refers to are mainly made of Polyethylene (PE). 2. What is the difference between microbeads and microplastics? 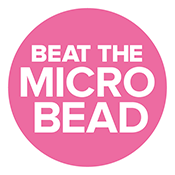 The term 'microbeads' is used by the Beat The Microbead campaign to refer to microplastic ingredients in cosmetics that become marine litter. The term applies to any type of plastic including for instance Polyethylene, Polypropylene, Polyethylene terephthalate, Polytetrafluoroethylene, Polymethyl methacrylate and Nylon. This definition continues to evolve in accordance with ongoing relevant scientific research. Cosmetic industry often limits the definition to plastic particles of a certain function, for example to scrub/peel with. 3. Is there a list of all microplastic ingredients that are used? There are no comprehensive lists of all synthetic polymers that can be considered as microplastic ingredients. For now, we stick to a list of 67 ingredients, published by the UNEP report, Plastic in Cosmetics and the Belgian TAUW-report “Test to assess and prevent the emission of primary synthetic microparticles”. You can find it here. 4. In what kind of cosmetics can we find microplastic ingredients? Microplastic ingredients are applied in a wide variety of cosmetics like deodorants, shower gel, hair spray, eye shadow, sunscreen, shaving cream and scrubs. In general, industry is phasing out plastic particles to scrub with, often described as microbeads. We do not refer to rinse-off or leave-on products, but to any cosmetic product (see the definition of the European Cosmetics Directive). 5. With what products are we dealing with? We want to end the use of microplastic ingredients in cosmetics- and in fact any consumer or industrial product where either the whole or parts of the product is disposed via drainage after use. This disposal can be either intentional (i.e. washing off a face scrub or removing make-up with a wash-off make-up remover) or unintentional (i.e. sunscreen that is applied to skin and then disposed through contact with water). Yes and No. As an ingredient in cosmetics, industry claims that microplastics are not toxic and safe to use. However, there are doubts about nanoplastic ingredients used in products like sunscreen. Nanoplastic ingredients may easily penetrate skin due to their extreme small size. Also microplastic ingredients in the sea absorb toxic chemicals as if they are little magnets. The particles become polluted and are eaten by fish and other sea animals. 7. What are the effects of microplastics in the environment? Microplastics have a damaging effect on marine life, since marine animals often mistake them for food. They are passed along the marine food chain and since we as humans are ultimately at the top of this food chain, it is likely that we also eat them. Also plastic particles are not biodegradable and once they enter the marine environment, they are impossible to remove. Hence the tiny particles ultimately contribute to the plastic soup swirling around the world’s oceans. 8. Is there any scientific evidence that microplastics pollute the oceans? Yes, there already exist many scientific evidence of microbead pollution, such as the findings of Professor Richard Thompson (University of Plymouth) who also coined the term. These findings are published in journals like Marine Pollution Bulletin or Environmental Science and Technology. The full implications of microplastic pollution including consequences for human health is not known. Microplastics in the aquatic environments is today recognized as a serious, emerging global environmental issue. However, cosmetics are not the only source of microplastic pollution. Most microplastics are the result of fragmentation of larger pieces of plastic. These microplastics are not produced as such, like the microplastics in cosmetics. Click also the link for more scientific evidences. 9. What about so-called liquid plastic ingredients? So-called liquic plastic ingredients are any type of synthetic polymer in liquid or water soluble form. Currently it is not known if liquid synthetic polymers are harmful for the environment. We call upon industry and science to prove that liquid plastics are not causing any harm to the aquatic environment. 10. Why do manufacturers add microplastic ingredients to cosmetics? Tiny plastic particles are pleasant for your skin to scrub with and have a smoother effect than natural ingredients, like nut shells or salt. Different microplastic ingredients in cosmetics have different functions, like film formation or viscosity regulation. Cosmetic industry uses microplastic ingredients because of these functions and because microplastics fill up products in a cheap way. In some cases a flacon can be filled up to 10% of its content with microplastic ingredients. 11. Are manufacturers phasing out microplastic ingredients from cosmetics? In December 2012 Unilever was the first multinational to announce phasing out plastic microbeads from their products worldwide. Other multinationals soon made similar statements. However, the industry uses many loopholes, like using so called 'biodegradable' alternatives (see Greenpeace report and the Plastic Soup Foundation's opinion on biodegradable plastics. Most of the company statements do not refer to the many microplastic ingredients they still use. 12. How do I dispose products that I already have at home which contain microplastics? Unfortunately, there is no 'correct' way to dispose products containing microplastic ingredients. We always recommend two options: either sending the product back to the manufacturer, telling why you decided not to use the product and that you will stop buying this product as long as they use plastic ingredients; the other option would be to dispose your products in the regular house-trash. It will be taken to a landfill or will be incinerated. These are, of course, the less environmentally friendly option. But at least the microplastics will not end up in the oceans. Check our ZERO products lists to see which products are 100% free of microplastics! 13. Is there political action taken to put a ban on microplastic ingredients? Yes and No. In December 2015, President Obama signed a US-wide legislation after a number of states had introduced a ban. Canada recently classified microplastic ingredients as toxic so that a ban could be introduced quickly. In summer 2016, France announced to introduce a ban by January 2018. Taiwan is working towards a ban by July 2018. In September 2016, the new English government announced that pieces of plastic in cosmetics will no longer be allowed to be sold in the UK by the end of 2017. The European Commission will hopefully introduce a ban, as well. However, most of these initiatives refer only to exfoliating microbeads and not to all microplastic ingredients used in cosmetics and many countries still prefer to rely on voluntary industrial commitments rather than acting on their own. For more information check out our Results timeline. 14. What does the 'Look for the Zero' logo mean? Even though many companies are phasing out plastic microbeads they still use other types of microplastic as ingredients (see UNEP report, Plastic in Cosmetics and the Belgian TAUW-report “Test to assess and prevent the emission of primary synthetic microparticles”). To make sure that cosmetic products are complelty free of any microplastic ingredients you need a guarantee. Our Look for the Zero logo is such a guarantee. Only brands and companies that do not use any plastic ingredients in their products are entitled to use this logo. Their products are really 100% free of plastic ingredients. 15. Are other NGOs supporting the Beat the Microbead campaign? Yes, at the moment the Beat the Microbead campaign has 94 Partner NGOs from all over the world supporting the campaign. Together we are a very strong international coalition. 16. Why has Beat the Microbead changed its focus? When we started the Beat the Microbead campaign in 2012, our focus was solely on five ingredients known to be the most commonly used microbeads in cosmetic products: Polyethylene (PE), Polyethylene Terephthalate (PET), Polypropylene (PP), Polymethylmethacrylate (PMMA) and Nylon. That is why the app, which we launched in 2012, only focussed on these five plastic ingredients. Today, we know due to scientific evidence that there are more than 60 different microplastic ingredients currently used in cosmetics. You will find microplastic ingredients not only in scrubs, but also in products like lipstick, eyeliner, sunscreen or in other cosmetics. It is vital for consumers to really know that the cosmetics they buy are free of any microplastic ingredients. Otherwise they might still be polluting the seas without realizing it. We decided to change the burden of proof. Instead of consumers having to check labels that are difficult to understand, we ask producers for a statement that their cosmetics are completely free of microplastic ingredients. Companies that make a public statement that their products are 100% free of microplastic ingredients are allowed to use our Look for the Zero logo. If you have any further inquiries, use our contact form to send us a message.